During the past two decades, socio-economic changes and new technologies have had drastic impacts on higher education in general, and on engineering education in particular. As such, we may consider the international market of engineering education graduates as an impact of globalization. In this respect, quality of engineering education has been considered as the major issue in technological universities and schools of engineering. Based on this, standard setting, evaluation of quality and accreditation of engineering education have been regarded as important issues of engineering education worldwide. There have been a number of attempts to propose standards in engineering education at the international level. As an example, we may consider Washington Accord (WA). In this respect, countries of North America have been pioneer. It is more than a century that universities in the U.S. have been active in the evaluation of higher education through general, professional and specialized institutions, such as A.B.T. in engineering education. The WA, which is about quality requirements in engineering education, has been gaining a wider ground. It was, first, ratified by six industrialized countries in 1989. Then, six more countries joined it. Recently, five countries including Germany, India, Malaysia, Russia, and Srilanka have requested for the membership of Washington Accord. On the other hand, research on “How should evaluation and accreditation of higher education, as a professional practice, be carried out to enhance the quality?” has been intensified in recent years. As an example, we may note the application of total quality management (TQM) and ISO 9000 models in higher education. These two models have not gained much attention for enhancing quality in academic environments. However, the accreditation model has been applied with greater satisfaction. Another issue which affects the quality of engineering education at the national level is transnational engineering education (TNEE). The TNEE is offered through different modalities at such joint programs between universities in two countries, or “exporting” engineering education from one country to another country. Therefore, there is a need for assuring quality of such engineering education programs. Based on the above, in this article, first, international experiences are reanalyzed. Then, a decade of research on evaluation and accreditation of higher education in Iran, with reference to engineering education, are reviewed. 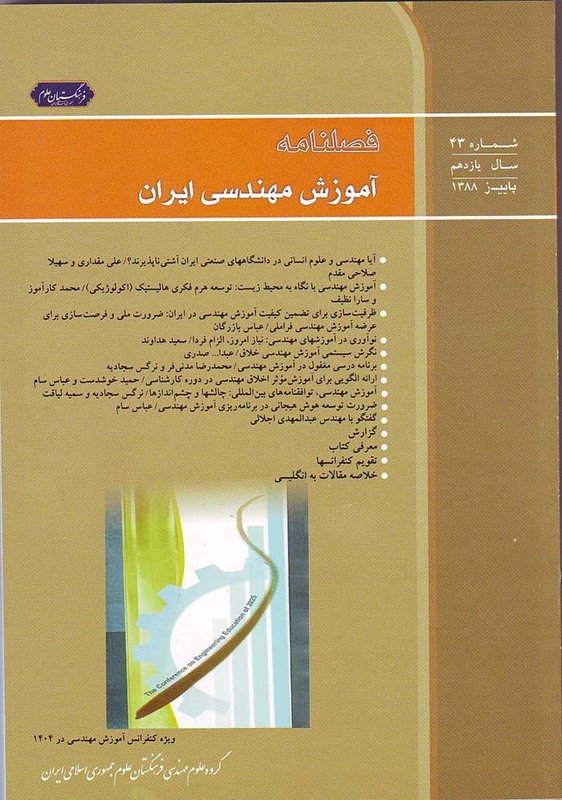 Furthermore, the research questions: “What is the necessity of setting-up a suitable organizational structure for assessing quality of engineering education in Iran?” and “How should it be realized?” are answered. In this context, the Iranian academic position in the region, among countries in West Asia, Central Asia, and the Middle East, is reviewed. Then the opportunity which exists for high-ranking universities in Iran to supply quality transnational engineering education in the region is discussed.